18k Gold Plated Sideways Initial Charm Necklace "t"
Two charms for Necklace. One Charms the letter A: gold tone; markings SU 925 TH. 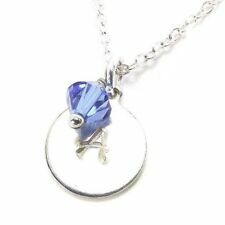 Like new condition Second charm heart with hummingbird and the name Ashley. Condition is good Pre-owned. The metal piece to attach to a chain needs repaired or replaced Shipped with USPS First Class Package. Both bracelet bridal cable characters. Material: stainless steel, 14 K gold plated. Material: stainless steel, 14K gold plated. NOTE: We cannot customize products. 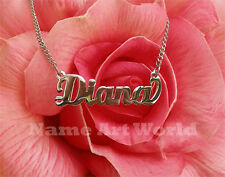 Name Necklace,made with stainless steel - High polished and no rust or tarnish. Stainless steel ): your choice from 14", 15" 16", 17" 18", 19", 20",21" 22". Length of chain it-self (. A grain of rice in the Glass Vial. ( One side or both side ) - No extra cost to write on both side. Necklace: Snake chain, silver plated. ( as shown in the photo). If you don't choose Micro bead color, I'll choos any color. 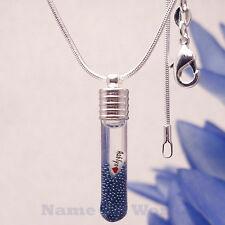 Name on rice necklace Long Tube with a real dried red flower in it. No extra cost to write on both side. Up to 11 character per one side: space must count for one character as well. Mulberry Studios Personalized Cherish Charms- "Allison" - New with jewel accent! 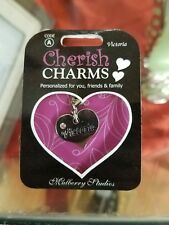 Mulberry Studios Personalized Cherish Charms- "Leslie" - New w/ jeweled accent! Mulberry Studios Personalized Cherish Charms - "Leslie" - Jeweled heart charm. Give her a little Flower Girl gift of beautiful gorgeous personalized Bling Bling Necklace adorned with Ivory pearl,round pave ball and rhinestones rings spacer. Material 8mm Ivory Pearl, Pave Ball 8mm and rhinestones rings. Personalized Stainless Steel Name Birthstone Bar Necklace. Condition is New with tags. Shipped with USPS First Class Package. Zippered, green and white stripe, with letter N. 3" X 5" CHANGE PURSE. In flawless, clean, excellent condition. Miniature Name Charm 1qty Mini Disc Pendant Custom kid date anniversary tag 1/2"
Ring Size Hair Accessories. Main Stone Main Color: gold. Ring Size Hair Accessories. Main Color: silver. Main Stone. 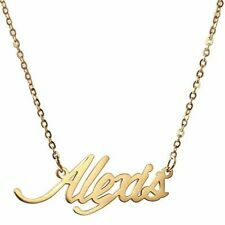 This beautiful personalized necklace makes a thoughtful and unique gift! Great for those who have names with unusual spellings. Hand stamped on an aluminum disk with any message up to 10 characters and letters, and including a gemstone charm in one of 8 colors: red, clear, black, green, pink, hot pink, blue, or aqua. 18” ball chain included. The necklace is sent in an organza drawstring bag for gift-giving. Material: stainless steel, 14 K gold plated. Item model number: WNL-2433 Lily Silver. Dispatched from China. Weight: 15gram. Name on rice necklace with a real dried red flower in it - for all occasions. New Altar'd State goldtone necklace. Delicate chain with a "Dallas" charm.